In Paramount, firefighters battled a blaze at a commercial site that damaged a building and trucks. It also sent out sparks from a power pole. 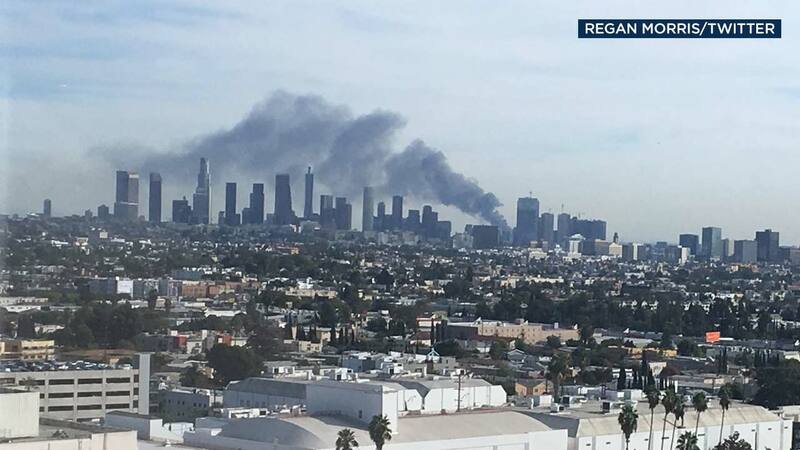 VERNON, Calif. (KABC) -- Firefighters responded to separate blazes Thursday at commercial buildings in Vernon and Paramount that sent thick plumes of black smoke into the air. The Vernon fire was reported around 1:30 p.m. in the 2900 block of E. Leonis Boulevard at a commercial building. Firefighters from multiple agencies were responding to the blaze. The cause of the fire was not immediately known. The fire was reported at 16616 South Garfield Ave. around 2:25 p.m. Firefighters appeared to be getting a good handle on the flames as they attacked it with water from several directions and reduced it to mostly thick smoke. A power pole at the scene was giving off sparks as the flames touched it, but it remained standing as firefighters doused the flames. Workers were seen calmly evacuating the site. Firefighters believed there may be hazardous materials on the site and a hazmat team was being called in. No injuries were reported in either blaze.